In The Nursing Shortage Isn’t Due to Lack of Interest, published on Monster.com, Sarah White details the current nursing shortage and puts forth a number of suggestions on how health care facilities can respond to the growing problem. Among her solutions are increasing the role of Licensed Practical Nurses and taking steps to decrease nursing burnout. However, these may not be the most cost effective solutions for hospitals and neglect to address the overwhelming number of cases nurses will be required to handle in the short term. By instead implementing various mobile patient engagement technologies, such as text (SMS) messaging and mobile apps, existing nurses and case managers can manage more patients simultaneously, improving patient satisfaction and decreasing nurse burnout. An aging population and the addition of millions of eligible health care patients due to the Affordable Healthcare Act have increased the demand for quality care; an issue which cannot be met by the current number of employed nurses. The Registered Nurse (RN) deficit has been steadily growing since 1998 and is expected to affect all areas of the U.S., with the largest shortage concentrating in the western region. The resulting number of nurses will not be enough to handle the 1.2 billion visits to physicians’ offices, hospitals, and emergency rooms each year. When a nurse’s time is spread too thin, the quality of care patients receive suffers and the likelihood of errors and accidents occurring increases. According to an article conducted by the Center for Health Outcomes and Policy Research, the more patients a nurse cares for, the higher the risk of health care-associated infections. With a number of nurses retiring, the increase in eligible health care patients, and the ongoing shortage, the number of cases that will need to be handled by RNs will only increase. Roadwork needs to be put into place to ensure existing health care staff can handle the volume and patients continue to receive quality care. One possible solution to the crisis which was not mentioned in The Nursing Shortage Isn’t Due to Lack of Interestis the growing number of technologies which allow providers and hospitals to provide quality health care in the face of dwindling or actively reduced resources. While technology alone cannot replace the duties of a nurse, it can help make patient care more effective. Outpatient after care can take up hours of a nurse’s week. Oftentimes traditional means of communication like phone calls fail to reach the patient in question or patients neglect to respond to voicemails, and without adequate outpatient communication there’s a higher risk of readmission. Lack of contact with a busy nurse or other health care provider can have patients running to the emergency room at the slightest symptom or concern. By integrating patient engagement technologies we can help reduce nurse burnout and encourage healthier behaviors and self-care. The use of mobile is wide spread, with 90% of American adults owning a cellphone – 58% smartphones and 32% non-smartphones. Similarly, texting is used across all age groups, income levels, genders, and racial backgrounds, with 81% of cell phone users sending and receiving text messages. The increasing amount of mobile phones which have access to both text (SMS) messaging and mobile web allows users to access a wider range of information and multimedia. With the help of texting programs, nurses and other health care staff can manage more patients, more easily. Reaching out to patients with phone calls can be unproductive in some cases, but with 31% of text message users prefer texting to voice calls, nurses can engage a wider section of their patient population. Messaging platforms offer both one-way and two-way communication to help nurses perform outpatient care duties. One of the biggest benefits of both of types of messaging is the ability for nurses to engage multiple patients simultaneously. One-way text messaging can be used to deliver preventative education, including images and videos. Information delivered this way allows patients to digest content quickly and often at a more convenient time, preventing unnecessary ER visits and educating patients on their condition. Nurses can also pre-schedule text messages and personalize them to specific a patient’s condition. Engaging with patients on a device that 79% of them keep within arm’s reach 22 hours a day is a surefire way to connect. By using this technology to disperse information to patients in their daily lives, health care providers can encourage healthy behavior and circumvent potential health threats with ease and in less time than it takes to call each patient or have them come in for a follow-up. Two-way messaging is a useful tool which can be used to follow up after an ER visit and collect information. It can also be used by health care professionals to circumvent unnecessary ER visits and calm worries by enabling them to answer questions in real-time. Conversations can be started by the nurse in order to check up on a patient or started by the patient when they have a concern. Even when nurse caseworkers are off duty the system works, with conversation being directed to a health care call center. As a result, patients develop a sense of connectedness and see their caseworker as someone they can rely on. Like text messaging, mobile apps can be a boon to nurses juggling a variety of cases. Typically, Americans spend 34 hours and 21 minutes per month on their mobile phones, with 86% of that time spent using applications. While gaming apps account for the lion’s share of app downloads, health and fitness apps are growing in popularity. According to Nielsen, 46 million unique people, or nearly one-third of U.S. smartphone users, accessed apps from the fitness and health category in January 2014, up 18% from 2013. That number is sure to keep growing and the potential benefit to health care professionals will increase as well. One way in which mobile applications can be of value is by allowing nurses to collect information from their patients when they are out-of-sight. Apps allows patients to easily monitor everything from their heart rate to their sleep cycle, and results can be shared with nurses and physicians as follow up to an appointment or for overall well care tracking. With mobile apps there is also more room to gamify health education and compliance. Whether it’s competing against friends on social medial or earning health-themed badges, many consumers are more prone to engage with an app that allows them to experience some enjoyment. Among the top reasons consumers use a mobile health or fitness app are for goal tracking, awareness of health issues, and motivation. By integrating a “fun” element whenever reaching a milestone, patients are more apt to track their health information. 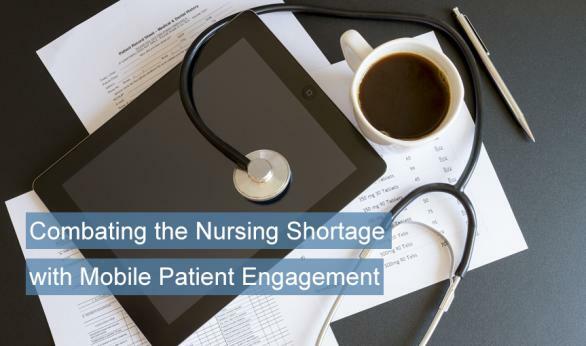 No one solution is going to “cure” the nursing shortage, but the implementation of texting and mobile apps can aid overworked nurses in the short term, as well as provide a cost effective companion tool in the long-term. Patient engagement technology can also be used to help decrease nurse burnout, which affects 49% of RNs under the age of 30 and 40% of RNs over 30. Already many health care providers are implementing mHealth into their daily routines. Smartphone use among nurses and physicians in their everyday practices increased to 86 percent in 2013. Forty percent of physicians said tablets help cut down time spent on administrative tasks. Mobile health is a growing field and one that is time and again proving its usefulness. By providing nurses with the right tools to manage additional patients, they can continue to provide quality care and keep the hospital environment free from potential errors.